Initially Anu was planning on doing some meditation in Dharamsala, however things changed slightly. Anu's new job meant that she didn't have as much time off as planned, so she decided to omit Dharamsala and join me instead in Rajasthan for the last 10 days. 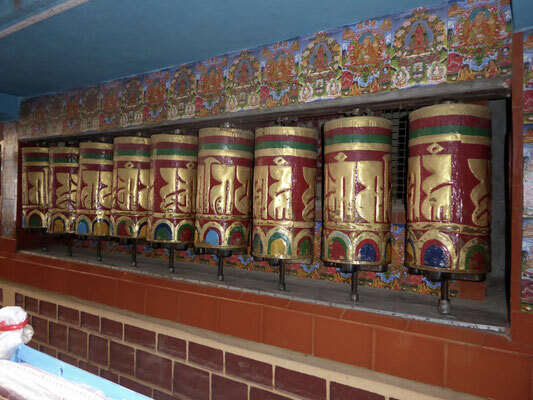 As for me, since my flights was already booked long before, I stayed with my original trip as planned: flying first from Hamburg to Delhi and staying one night at a hotel close to the airport, then in the morning continuing to fly to Dharamsala. Be warned, as soon as you leave the Delhi airport you'll be harassed by taxi drivers desperately wanting your business (extremely annoying, particularly after the long flight. There is a pre-paid taxi stand and here you can get a taxi at non exorbitant prices. You pay at the stand and receive a receipt with your name and the destination and you get your taxi almost immediately. My hotel was very close to the International Airport, so I had to pay less than 5 € for the taxi. The next morning, as the plane approached Dharamsala it was experiencing some turbulence with the strong winds, but the pilot laid down a perfect landing! At this very small airport, it was a lot quieter and similar to Delhi there was a taxi stand offering a fixed price. What I didn't realise was that my hotel (Backpacker Inn) was not accessible by car so I had to shoulder my luggage and walk approx. 100 meters up a steep mountain. By the time I arrived at the hotel, I was pretty exhausted but I was then rewarded with a magnificent view of the snow capped mountains. I found that many tourists are here not only for the beautiful scenery, but for meditation and/or yoga. This is evident almost immediately by looking at the clothing of the tourists- which reminded me of the hippie era. 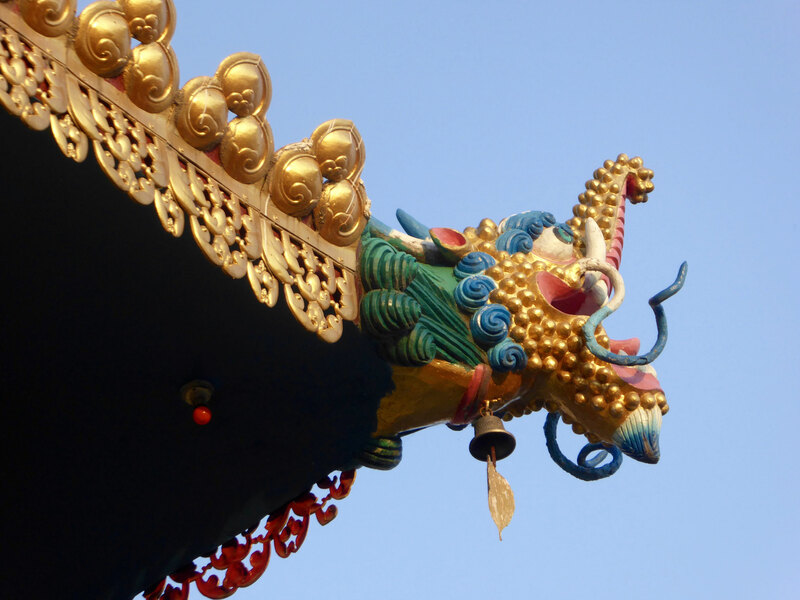 I had not imagined my sightseeing on the first day to Dharmakot to be so long and cumbersome. Had I known this earlier, I would have taken a taxi or a tuk tuk (instead of walking all the way) and only traveled the last 45 minutes to the waterfall by foot, this would have saved me almost 2 hours. The next morning my legs were thankful that I had not made my way all the way to the waterfall! Along the way to the office of the Dalai Lama I passed by a group of monks talking loudly together, engrossed in a discussion they were having together. I was glad I got to experience this. The Tibetan Museum is very impressive and many interesting and sad stories are to be told. The small temple Sh Gallo Devi was quite disappointing and certainly not worth a visit. The next day I walked in the same direction but this time to Bhagsu Naag. This is an emerging place where many new houses are built. From here you can go first to the temple and then onto the Bhagsunag waterfall. It's actually the same waterfall as the one from Dharmakot, only that the road from this route is a lot bigger. Many people are seen taking a refreshing swim at the waterfall. 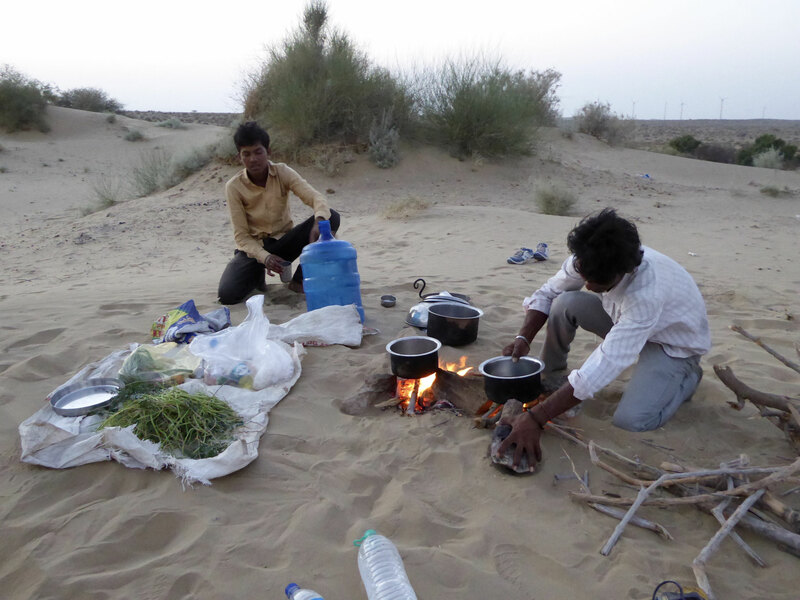 On the last night I met two travelers in my accommodation who gave me good tips for Rajasthan. My flight to Jaipur went smoothly, everything went according to plan. I arrived at the airport in Jaipur and went straight to the pre-paid taxi counter. After a short while the taxi driver who took me to my hotel told me that he could also be my driver around Rajasthan. 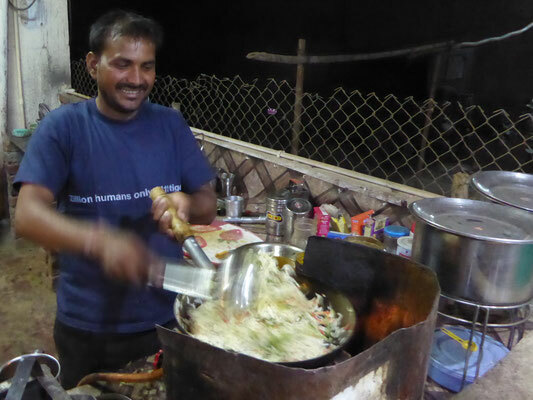 He quoted 25,000 rupees for the full tour (9 nights) and then handed me his phone number. I am still at the hotel reception, when young woman (traveler) and asks me if I would like to go to the town with her so that we could share the Tuk Tuk ride. Although I was exhausted by the flight and the extreme heat I don't think twice about it and agree to go with her. She wanted to visit the Govinj Devij temple which was not open in the morning. 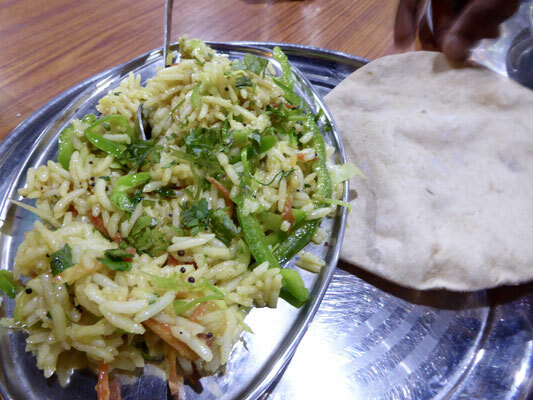 The temple was disappointing and so we went to a restaurant to satisfy our hunger. 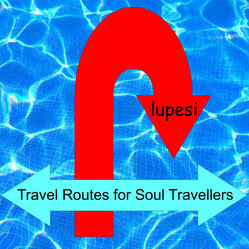 She was a Ukrainian traveler who got stuck unwillingly for a few days in Jaipur. She was planning on visiting her friend in Goa, but her friend prematurely departed because he had enough of India. Having satisfied our bellies, we go through the buzzing bazaars towards our hotel. After some time we decided that it's better to take a tuk tuk, because we still had quiet a distance to go and we were exhausted. 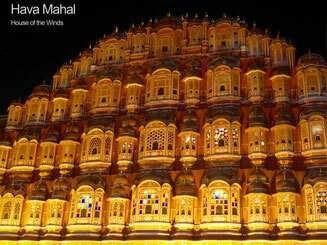 Before we return to the hotel we passed the Hawa Mahal the so-called "Palace of Winds". An impressive building that particularly in the evening when a special aura comes through the many small and colorful windows. Tired and exhausted, I fall into bed. The next morning, as I wait in the hotel garden for Anu to arrive, I see the taxi driver approach as he is keen to know if I have come to a conclusion about my decision to use him as our driver (or not). I told him I haven't yet made a decision as Anu has not arrived yet and I do not want to make this decision alone. It was only after a long wait that I realise I misread her arrival time. So in the very hot heat of Jaipur, I seize the opportunity to get a better deal for a car and driver. When I return back to the hotel, I begin to realise that I was probably out in the sun and heat for too long, as I am exhausted. Luckily for me, I feel better the next day. Anu could take a flight from Delhi to Jaipur earlier, so that she arrives in the morning at 6:30 am at the hotel. Quick, we agree that we take for the time a car with a driver, since the shortness of time so requires and also of the extreme heat at that time in Rajasthan. At 10 o'clock, the driver Mr. Singh arrives at the hotel. 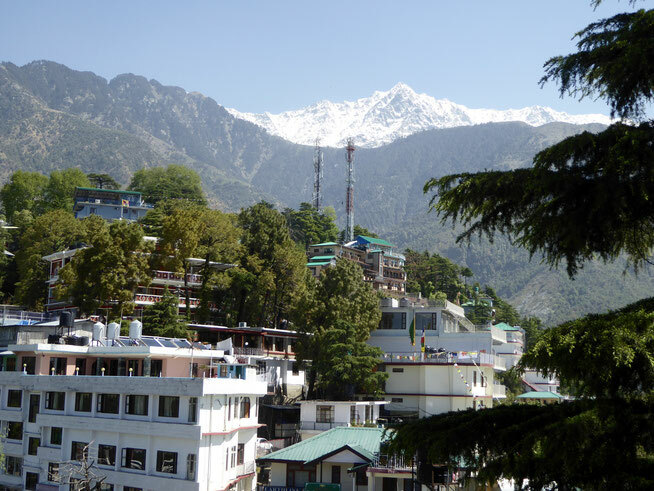 I had heard of the Frenchman in McLeod Ganj, that we should go in any case to Bundi, we agree on a price of 27,200 rupees with the driver to go there also. He now had to travel 200 km more. I agree prematurely, as it turned out later. In Pushkar we decided to make a Safari in the hope to see a Tiger. 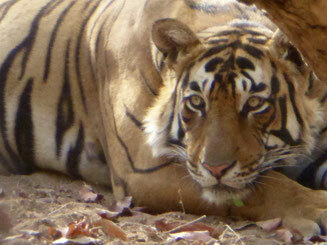 The best possibility and chance for that seemed to be the National Park of Ranthambore. This we explanded our driver in the morning and he told us that he would need 3000 rupees more to drive us there from Pushkar. But I was not ready again to pay a higher price than agreed and tell the driver that we forget the last night and then pay for the originally agreed amount of 25,000 rupees. He would be one day earlier at home. So our driver was completely disagree. The Indians with whom we dealt are extremely after the money and that nerves. Unfortunately, they forget that a deal is reciprocal and everyone should feel satisfied. Our visit to Bundi was much appreciated. In a cafe in Budni we had the recommendation to go to the restaurant "Millets of Mewar" on the other side of the bridge in the Amhapol Road. 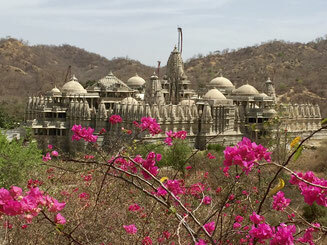 The temple of Ranakpur we found very impressive. Especially the fact that it is beautifully located and many smaller temples are located around the big temple. Jodpur offers the fort. In the old town we had a room in an old Havela which had a fantastic view from the roof terrace of the fort and the town. 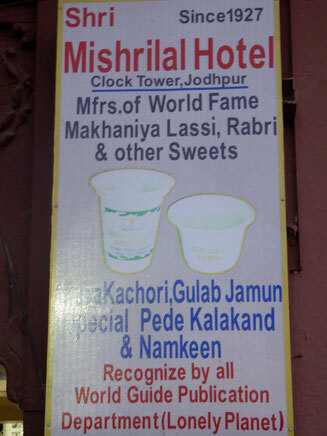 The place at the Clock Tower where you should have the best Lassi in Rajasthan. Here one should consider whether you can not buy at the comparable price in Germany the spices. In any case, however, it is a good gift from Germany. On Facebook is an Indian from Jodhpur had befriended me. 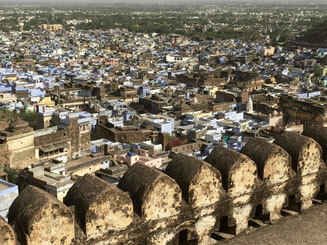 I did´t thought of that when I was in Jodhpur visiting the Fort Meherangarh. In top of the Fort you can use an elevator to visit the premises of the successor of Maharaja Jaswant Singh, who lived there until 1943. I wanted to get informations about it and went to a counter. I decided not to visit the prince rooms and so I went out of the fort area to look to the city. To my surprise a man called suddenly my name and told me that we know each other. But my expression remained doubtful, as I had never seen the man before. "We know each other on Facebook" and now I remembered that I had indeed an Indian from Jodhpur, the "friendship" offered. He was the one who had sat at the counter and recognized me there. The surprise was great. He invited me to a tea and we arranged to drink Lassi in the evening (see above). What coincidences there are many things in life with which one does not count. Had I been there a day earlier, we wouldn`t have met, because he has not worked that day. 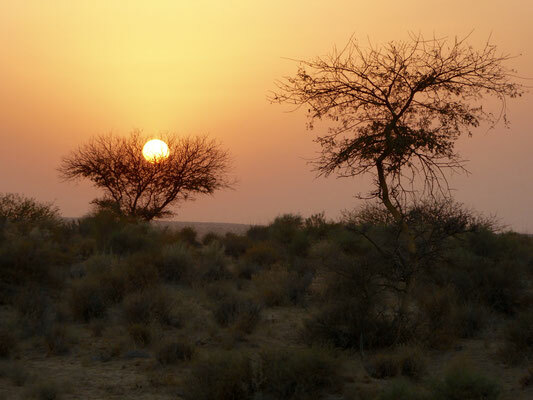 We enjoyed the beautiful sunset in the desert Thar near Jaisalmer. We had agreed with the driver that we wanted to stay one night in Jaisalmer in the hotel and then one night in the Thar desert under the stars. After breakfast he told us then that he wanted to take us first to the desert town Kanoi and let the 2nd night at the hotel in Jaisalmer. That would be better. Why, he could not tell us. Arrived in Kanoi (actually not a village, but a place with several Safari resorts). After Jaisalmer and the evening in the Thar desert, we went to Bikaner. A street with incredibly many construction sites. One had the impression that a good third of the route will be renewed. The new road is constructed higher, which suggests that during heavy downpours, the old road was flooded. Arrived in Bikaner we visit first the City Palace, Junagarh Fort from the 16th century. 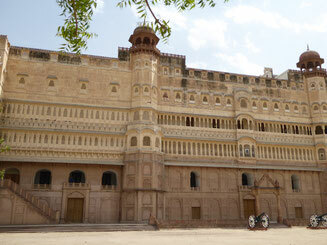 He is Considered the best preserved Rajput palace. 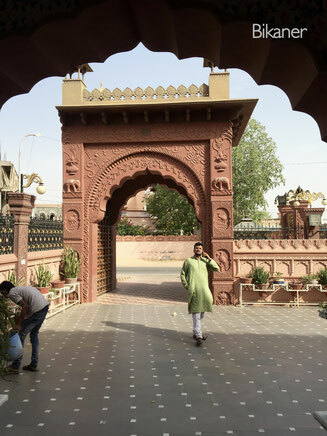 After the palaces and forts of the other cities in Rajasthan, we were not very impressed and could leave the city Bikaner on our trip. After the palace tour our driver drove us to a 5-star hotel. 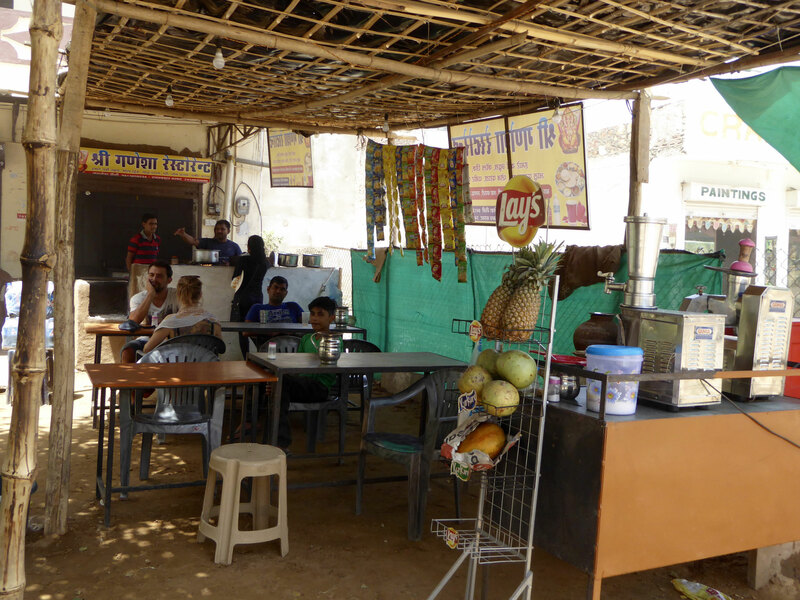 According to our relatively inexpensive lodging in Rajasthan, we were quite surprised that our driver took us to such an expensive accommodation. But now as we were at the hotel we let us show a room, but from the beginning we told that we would´t pay more than 1500 rupees (about € 15) breakfast included. The second room that was shown to us was much smaller, a window located to the inside area of the hotels and a interior with simple facilities but a price 1,000 rupees above the price quoted by us. The bedspread lying on the bed had had a large spot and was the occasion for me to point out that this is not equivalent to a 5-star hotel and our asking price quite justified. This was of course very embarrassing for the hotel and so we had no more to negotiate. We got the room to the price we wanted. 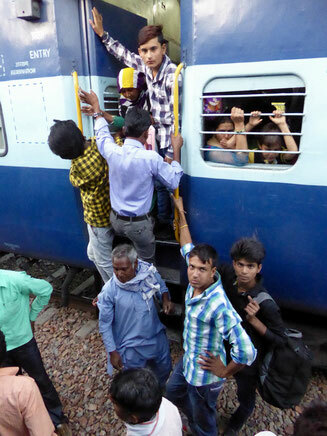 The next day our driver drove us to the train station in Jaipur. After we cleared it up from which platform the train to Sawai Madhopur went we bought our return ticket. 2 days later we had to be in Jaipur because Anu had their flight back to Australia. It took some time to get the ticket, so I was glad we were on time at the station. The clerk listened to my concerns, then he had some other work to do before he handed me a form that I could fill out. So I had to row again in the line again before I got my ticket issued. We had an almost 4 times as expensive ticket for the outward journey, because all the cheap seats were full when we booked the ticket in Jaisalmer. It was a place with a sleeping place for each of us, but what we did not need because we went during the day and needed only 2 hours for the journey. For us it was still quite low because we paid only 18 € for both of us. In Sawai Madhopur we let us drive with our tuk tuk driver to the hotel Tiger Home, which was already towards Ranthambore NP. We had picked this hotel in advance on the internet and also turned out to be quite good. We booked our safari for the next morning via our hotel. On time at 6 am o'clock we were picked up by an open truck with about 20 people. The approximately 3.5-hour-safari was great. We were thrilled to see the tiger, which is not so obvious. 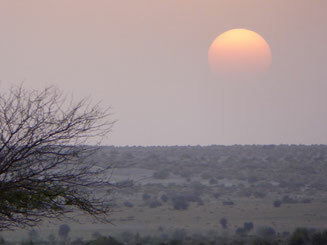 A French couple was the second day on safari. Just in time we were back at the station to go back to Jaipur. In Jaipur we were immediately harassed by alighting from an Indian tuk tuk driver who never left our site. On a pre-paid counter we paid the trip to the airport and to my hotel. Unfortunately, my hotel was situated before the airport, so I was deposed before. I got a queasy feeling if Anu would safely arrive at the airport, so I gave Anu 500 rupees (about 7 €) as a precaution. For the case of falls! But it all went well, except verbal harassment that he still wanted to go to a shop near the airport. 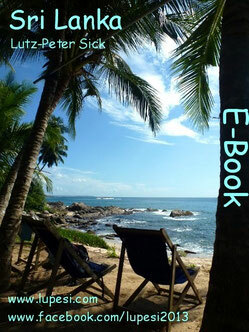 I had one more day before my flight back to Hamburg. I used the day to work on my many photos and create a slideshow. That was so good, because I knew that I would once have no more time after my return to work on my journey, because my daughter wanted to get married three days later. As a conclusion of the trip can be said that it was too short and the wrong time of year. It was too hot. The months December until February are more suitable. It was great that I could make the journey through Rajasthan together with Anu. We understood us pretty well, there were no problems at all and we had a lot of fun together and great conversations.